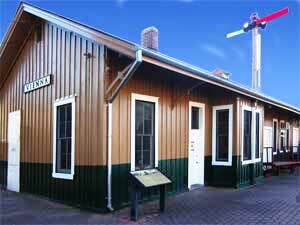 The Northern Virginia Model Railroaders (NVMR) is a club of model railroading enthusiasts headquartered in the historic train depot in downtown Vienna, Virginia. The club is over 65 years old and has been at this location for more than 30 years. With a membership of over ninety men and women, the club built and maintains a large and permanent model railroad layout (HO scale) and opens its doors twelve times each year to the public. Open House visitors include people of all ages who enjoy watching railroad activities that realistically depict an actual railroad that existed in North Carolina in the 1950's. That railroad was called the Western North Carolina (WNC) and every hill, town, building, locomotive, rail car, and industry on our layout is modeled after those places and things as they looked in that era. Well, almost everything; we must admit that to satisfy popular demand, an occasional sighting can be made of Thomas the Tank Engine and a few of his friends chugging around among the bigger steam and diesel locomotives. Digital Command Control (DCC) is used on the layout. DCC is a relatively new model railroading technology that permits independent operation of multiple locomotives and other equipment on the layout. Using DCC, club members can walk around following their respective trains using a hand-held remote to control their operation. As a result, a high degree of realism can be attained in railroad operations on the model layout. In addition, during Open House operations, members often provide their own locomotives and controllers while the club provides the cars, resulting in a greater variety of railroads represented on the layout. The real-life Western North Carolina Railroad was a regional railroad that ran 138 miles from Salisbury to Asheville, passing through Statesville and a handful of other North Carolina towns. Each of these towns are represented on the Northern Virginia Model Railroaders' layout. Salisbury's classic, Spanish Mission-style train station and nearby Spencer Yard are starting points for most of the rail operations on the layout. At our Open Houses, visitors can observe realistic train movements as small switcher engines move cars around Spencer Yard to assemble trains. Each train is then connected to a larger locomotive that then rolls down the mainline track to other rail centers in distant towns, finally arriving in Asheville at the end of the day. At each town, WNC trains will drop off and pick up cars using procedures and following train orders just like the real WNC did back in the 1950's. Many of our Open House visitors are real-life railroaders who delight in showing their children or grandchildren what a railroad does. The Blue Ridge Traction Power & Light Company (BRTP&L), a traction (or trolley) line, is also featured on the layout. While fictitious, the BRTP&L realistically depicts trolley, interurban, streetcar and freight operations in and between some of the towns served by the Western North Carolina Railroad including several freight interchange points. Recently, the overhead power wire has been electrified so that trolley poles are connected just as they were in actual operation. Please join the Northern Virginia Model Railroaders at our next Open House. In addition to our nine regular Open Houses throughout the year, we host three special Open Houses in conjunction with special events of the Town of Vienna, two in the spring during VIVA! Vienna Days, and another during the winter Holiday Season. All our events are free; however, donations are accepted. Check our schedule for dates and times.